Located at the top floor of Jcube (previously - Jurong Entertainment Centre), a newly built mall which housed the second IMAX theatres locally and highly acclaimed olympic-sized ice skating rink that opened their doors earlier this year, Manna Story has made another of its nest there in the midst of cool air. Like most Korean restaurants, it boasts authentic Korean cuisine served in a homely environment. Bromance ZR, Tim and yours truly decided to have our virgin experiences (okay, that sounds pretty gay) right there. On a typical Saturday night at approximately 7pm, we expected to see restaurants filled with diners, but it was barely half-filled when we got there. Upon ordering, one of the service staff served us an impressive platter of assorted appetizers, which usually in other restaurants - the most you can get is probably a maximum of 4. For the benefits of all kiasu Singaporeans, this is refillable but please do not waste. My favourite was the peanuts (2nd row, most right) if you want to know. It is slightly different than the ones you would have in Chinese restaurants, this is harder and a tad more chewer. It was like popping sweets and trust me, it is addictive. 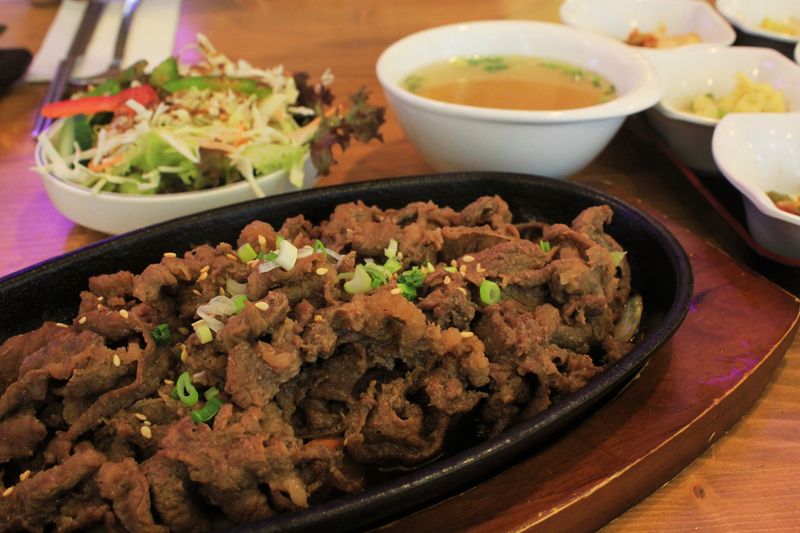 For me, I had their sizzling plate of BBQ Beef (S$13.80) with bowl of white rice, salad and soup. Quantity-wise, it exceeded my expectations, however quality-wise, it was a little dry and hard. There is a small 20% chance you could find a piece that is juicy and tender. Other than that? Keep digging. We ordered their promo item - Kimchi Pizza Bab (S$8.80) for sharing. 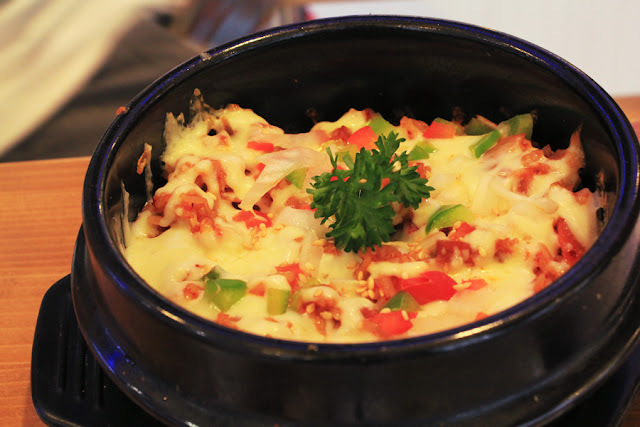 Although not exactly pizza, the name simply means Kimchi rice topped with melted cheddar cheese, tomatoes and capsicum. This is good, I love how well the cheese complemented the kimchi rice. 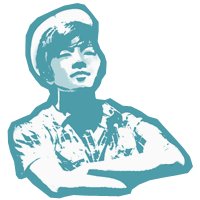 I just wished that there was more kimchi in the rice. Curry Pork Cutlet (S$14.00) tasted like their Japanese counterpart. 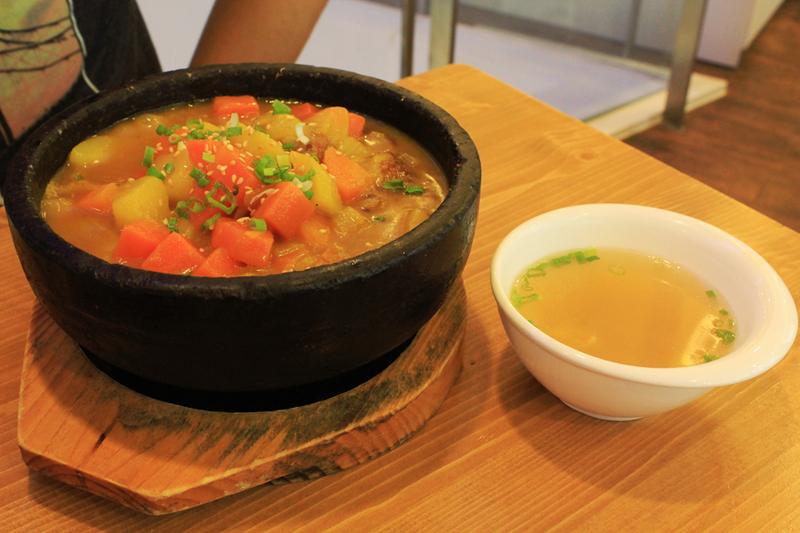 Thick, juicy, curry-drenched pork katsu topped with carrot and potato cubes. Do you know what I wanted to say? OM NOM NOM NOM. 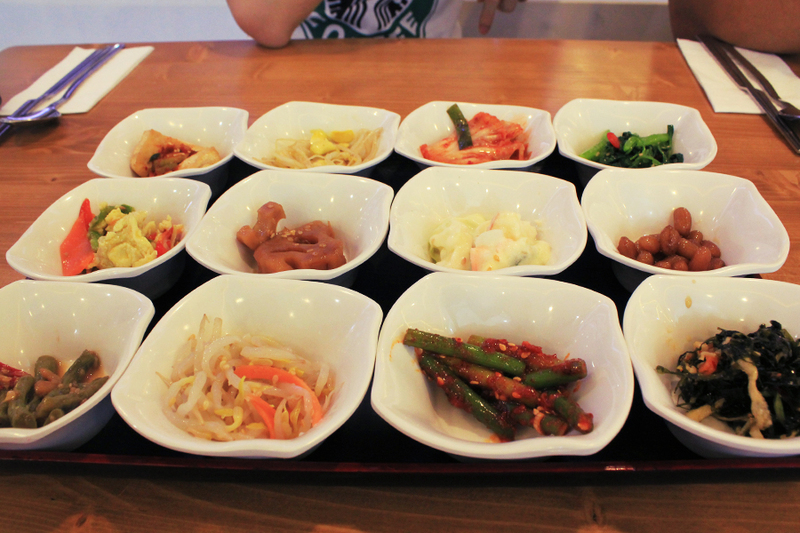 Mul Naengmyeon (S$11.80) was a disappointment according to ZR. This bowl of Korean cold noodles in plain broth (or water as some might call it) is better appreciated in smaller portions, and when not consumed in chilly weathers. 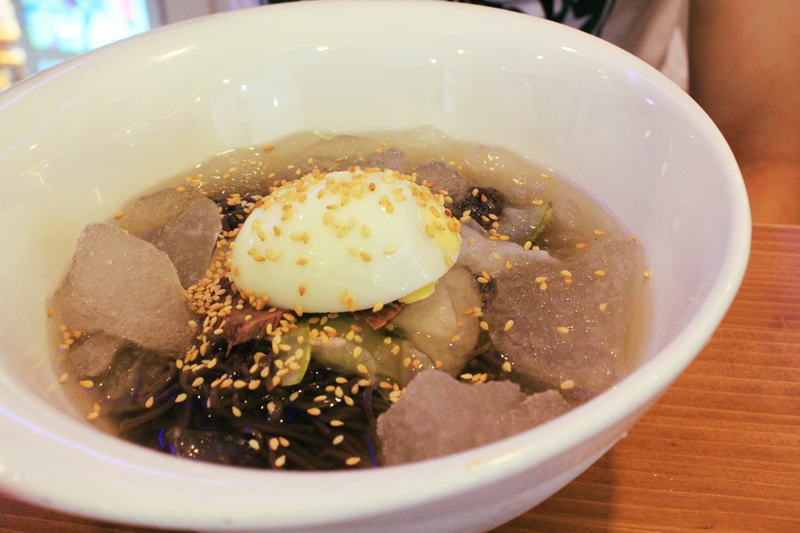 For me, I definitely prefer the Bibim Naengmyeon (which they don't serve here) - cold noodles with broth made from beef. The whole dinner costed us S$59.70, including service charge and prevailing government taxes. Is it worth visiting again? Well, maybe I might.. if I ran out of food to try.